Every day we each use a variety of personal care products. We wash our hands with antibacterial soaps and clean our faces with specialty cleansers. We wash and maintain our hair with shampoo, conditioner and other hair care products. We use deodorant and perfume or cologne to smell nice. Depending on the day, we may apply sunscreen or insect repellent. All of these products contribute to our quality of life. But where do they go after we use them? When we bathe, personal care products wash off of our bodies and into sewer systems that carry them to regional wastewater treatment plants. However, these plants are not designed to treat the thousands of specialty chemicals in pharmaceuticals and personal care products. Many of the active and inactive ingredients present in these products pass through our wastewater treatment plants and ultimately end up in rivers, streams or oceans. Once in the environment, these chemicals may cause hormonal effects and toxicity in aquatic animals. In my laboratory we are studying these emerging water pollutants, which are turning up in surface water, groundwater and even treated drinking water. Although they are typically found at low concentrations, they may still threaten human and ecological health. Personal care products and their ingredients are widely distributed throughout our environment. In one recent study, our lab aggregated over 5,000 measurements of active ingredients from a variety of personal care products that were found in untreated wastewater, treated wastewater and surface waters such as rivers and streams. They included N,N-diethyl-3-methylbenzamide, or DEET, an insect repellent; galaxolide, a fragrance; oxybenzone, a sunscreen; and triclosan, an antibacterial compound. Other studies conducted near the Mario Zucchelli and McMurdo & Scott research bases confirmed that chemicals in personal care products were even present in Antarctic seawater. Those reports identified the presence of plasticizers, antibacterials, preservatives, sunscreens and fragrances in the Antarctic marine environment. Together, these studies suggest that the active ingredients in personal care products can be found in any water body influenced by human activity. These substances are typically present in the aquatic environment at concentrations of 10 to 100 nanograms per liter, which is equivalent to 1 to 2 drops in an Olympic-sized swimming pool. But even at these low levels, some still pose a risk. Depending on their chemical properties, we can classify some of these products as hydrophilic (“water-loving”) or lipophilic (“lipid-loving”). The fat layers in our bodies are comprised of lipids, so lipophilic personal care products can accumulate in the tissue and organs of aquatic animals like fish, birds and even dolphins. Our group has recently detected a suite of sunscreen agents and 17α-ethinylestradiol, a synthetic form of the hormone estrogen that is the active ingredient in birth control pills, in crayfish from urban streams near Baltimore, Maryland. We have also measured sunscreens in oysters and mussels collected from the Chesapeake Bay. The uptake of these chemicals by aquatic animals raises environmental concerns. Specifically, as lipophilic chemicals from personal care products accumulate in animals at higher concentrations, there is a greater potential for them to cause toxic effects. For instance, many personal care products disrupt hormone systems in the body. Some chemicals used in personal care products affect reproductive systems and function, causing the feminization of male fish. These reproductive effects can have important consequences for aquatic animals in the environment, and they may even represent a potential health risk for humans. Last year, the Food and Drug Administration banned the use of triclosan and a number of other antibacterial agents in antiseptic wash products due, in part, to health risks associated with hormonal effects. 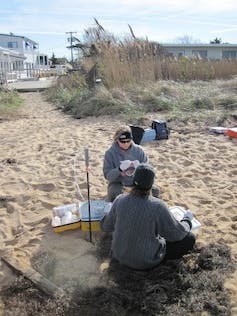 U.S. Geological Survey hydrologists sampling shallow groundwater near septic systems on New York’s Fire Island in 2011. The scientists found hormones, detergent degradation products, fragrances, insect repellent, sunscreen additives, a floor cleaner and pharmaceuticals, indicating that contaminants were moving from the septic systems into groundwater. Chris Schubert, USGS. Recent research has shown that oxybenzone, a sunscreen agent used in many personal care products, is toxic to corals. For many coastal communities, coral reefs are critical to local economies. For example, the net value of Hawaii’s coral reefs is estimated to be US$34 billion. Typical wastewater treatment plants are designed to treat multiple pollutants, including organic carbon from human and food waste; nutrients like nitrogen and phosphorus; and pathogenic bacteria and viruses that cause disease. However, they are not equipped to handle the many ingredients of concern that are present in personal care products. Protecting the environment and human health from these substances will require progress in several areas. They include improving technologies for wastewater treatment plants; conducting more testing and regulation of personal care products to avoid unintended toxicity to aquatic animals; and designing “green chemicals” that do not pose toxicity concerns. This multi-pronged approach will help us to ensure that personal care products continue to improve our quality of life without harming the environment. Lee Blaney is an Assistant Professor of Environmental Engineering at the University of Maryland, Baltimore County.